Electrik bar rounds off a year of stripped-down DJing with Graham Massey joining One Deck Wednesdays. The Chorlton bar’s monthly mid-week music night challenges crate-diggers to use only one record deck – no effects, no frills, and certainly no decorations. 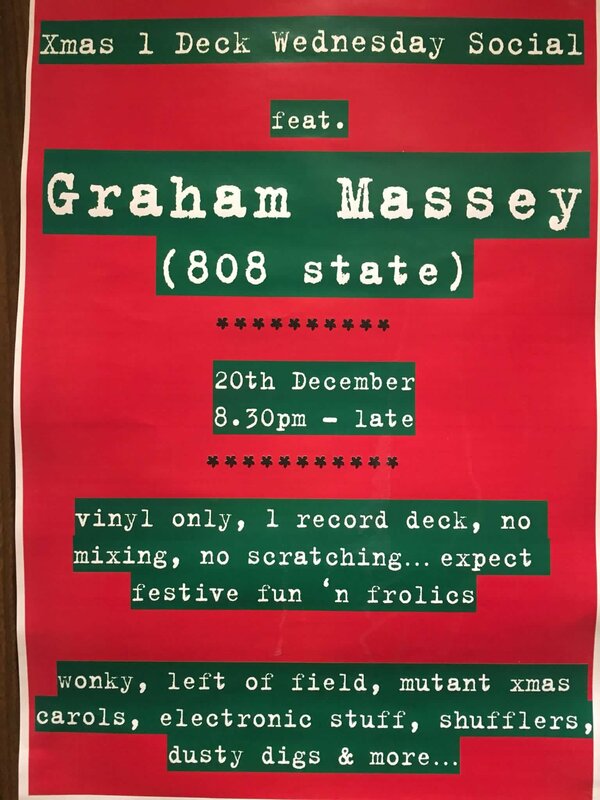 The 808 State star flings open his record box for an evening of wonky beats and leftfield tunes on Wednesday 20 December 2017. As well as enjoying hits ‘Pacific State’ and ‘The Only Rhyme That Bites’, Massey has produced for Björk and has brought his techno know-how to Homelife, Toolshed and Sisters of Transistors. Expect an eclectic mix of tunes – and an alternative office-party vibe – for One Deck Wednesday’s last bash of 2017. Entry is free.